Pawperty: Poached Baby Gorillas Rescued! Six endangered mountain gorillas were returned home to the Democratic Republic of Congo on Sunday after being rescued from poachers who smuggled them into neighboring Rwanda. The gorillas, who range in age from 5 to 8 years old, were victims of what's become a widespread issue in Africa: animal trafficking. According to Rwandan and Congolese authorities, poachers are thought to have killed the gorillas' parents in order to steal their babies and smuggle them across the border. Rwandan officials told Reuters that it's likely the poachers were planning to either sell the gorillas on the illegal wildlife market or slaughter them for their bushmeat, which is considered a delicacy in some areas of the continent. But because of a renewed collaboration between the Rwandan and Congolese governments, these gorillas were among the very few poached animals that are lucky enough to be rescued. "Because the countries are working together, we managed to reduce that [poaching]," Rica Rugambwa, Rwanda's director general of tourism and parks, told Reuters. "We are able to minimize that but it is still a challenge." 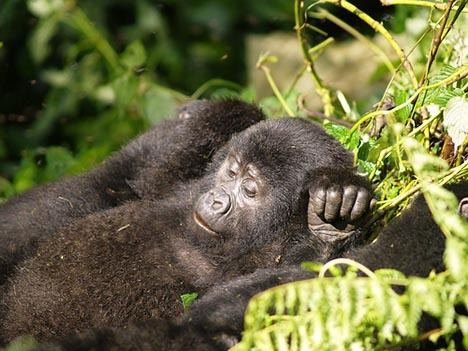 It's estimated that only 680 mountain gorillas live in the forests of Central Africa. The species has been listed as critically endangered, and many are protected within the confines of a Ugandan national park. Others live in the Virunga Volcano Region, which stands on the borders of Rwanda, Uganda and Congo - a dangerous area that has been overcome by civil war in recent years. The six rescued orphans stayed in Rwanda briefly before being airlifted back to Congo, with help from the International Fund for Animal Welfare (IFAW) and the Dian Fossey Gorilla Fund, the conservation groups that sponsored the trip. The gorillas are now being cared for at a rescue center until they are eventually able to be released into the wild.